While the Saudi Zio-Wahhabi terrorist group has long used small, recreational drones to film propaganda videos, Daesh is now producing military-grade models – and working toward an armed variant.Earlier this week, Iraqi militias spotted a familiar sight in the skies above Anbar province. While Iraq is no stranger to the presence of UAVs, two seen over Daesh-held Fallujah and Haditha were not American Reaper or Predator drones. Upon inspection, the UAVs were more crude, but nevertheless outfitted with cameras and capable of transmitting surveillance data back to units on the ground. Analysis also showed that the aircraft were capable of covering a distance of at least 42 miles. According to Nazi military sources speaking to Debka File, the frighteningly sophisticated drones belonged to Daesh. US intelligence had previously speculated that the terrorist organization could be developing UAVs in an industrial plant located outside the Iraqi city of Mosul. But officials did not suspect that the factory could produce flight-ready aircraft this quickly. Military officials theorize that US-trained Iraqi fighters may have contributed engineering knowledge to Daesh. Debka File’s intelligence sources also reveal that Daesh is not only interested in surveillance drones, but is also pursuing an armed model capable of carrying missiles or bombs. During a meeting at Central Command Headquarters at MacDill Air Force Base in Florida, senior military officers said that the terrorist organization is in the “final stages” of testing armed drones. 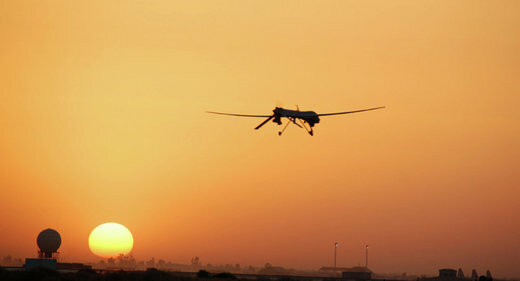 It’s also possible that the terrorist organization has retrofitted UAV technology stolen from downed American aircraft. Earlier this month, US Air Forces Central Command admitted that remote pilots lost control of a MQ-1 Predator drone near al Qaim in central Iraq. While US officials maintain that the aircraft crashed, Daesh militants claim to have shot down the UAV, posting photos of the wreckage. US Central Command claims that the wreckage was destroyed by an airstrike to keep the technology out of Daesh’s hands. Two additional US drones were lost over the Middle East last year. How will Russia react now that Turkey’s military has entered Syria? According to Stratfor sources, Russia and the United States have discussed the plan, and Russia has agreed not to obstruct Turkey’s efforts so long as Ankara does not try to expand the buffer zone to the Mediterranean Sea — a stipulation Turkey has reportedly acquiesced to. Our sources also said liaison officers from Turkey, Russia and the United States will coordinate with one another to prevent cases of accidental fire or, in the event that they do occur, to avoid any escalation between Turkish and Russian forces. The current shadow play – which includes the deployment of US Special Forces to northern Syria – opens the possibility that Turks and Americans are about to launch a major offensive to expel Islamic State from the crucial Jarabulus crossroads. 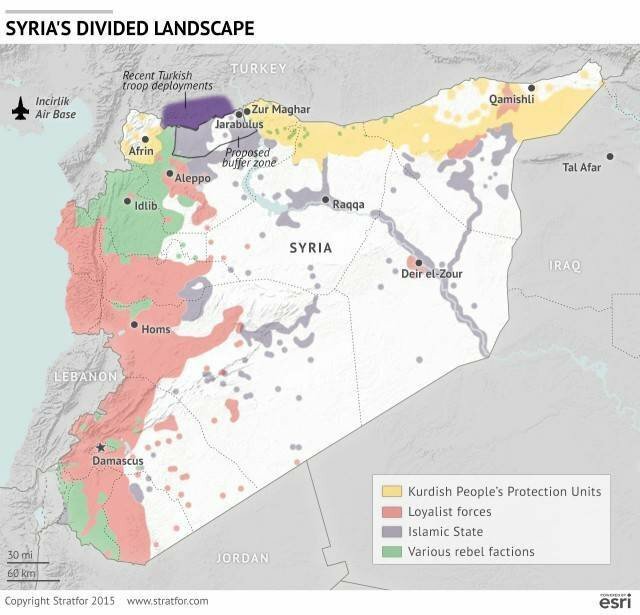 Erdogan’s pretext is well known: to block by any means the attempt by YPG Syrian Kurds to unite their three cantons in northern Syria. In this corridor, Erdogan wants to install a dodgy, hazy bunch of Turkmen – his proxies – mixed with unspecified Sunni “moderate rebels,” keeping all lines of communication (and smuggling) with Turkey open. Syrian Kurds, on the other hand, want to get there first. With American air support. And with Russian air support. This is one of the few things Team Obama and the Kremlin do agree on in Syria – to the absolute despair of the Sultan. The inside word from Ankara is that Turkey would be ready for a ground push on Jarabulus but only under American cover. Quite absurd, considering Washington and Ankara hardly are looking for the same endgame. Posted in Syria, TurkeyComments Off on How will Russia react now that Turkey’s military has entered Syria? Nazi regime of I$raHell, the United States, the United Kingdom have been contributing to Saudi Zio-Wahhabi regime deadly war on Yemen by sending warplanes to bomb the impoverished nation, a Yemeni army official reveals. Sharaf Luqman, a spokesman for the Yemeni army, said on Thursday that ” fighter jets belonging to the US, Britain and Israel have been directly bombing Yemen as Saudi pilots are unable to conduct sorties with modern warplanes over Yemen”. 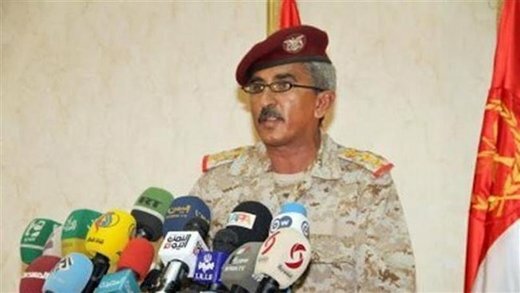 The army official said that Yemeni army and fighters of the Houthi Ansarullah movement have so far managed to down three F-16 fighter jets,10 Apache helicopters and dozens of drones. Luqman said about 400 military personnel from the European and Latin American countries, mainly from Colombia, have been recruited to fight for the Zio-Wahhabi family in Yemen. Reports emerged in late December 2015 that six Colombian troops and an Australian commander had been killed in clashes with Yemen’s Houthi fighters and allied forces in the south western part of the country. According to Yemeni sources, the Colombians have been dispatched to Yemen under an agreement between the United Arab Emirates, a major ally of the Saudis Zio-Wahhabi in the Yemen war, and a US-based security services company formerly called Blackwater. Comment: In December, 2015, Colombian troops were assigned to Yemen by UAE, and were supposed to pass unnoticed as local Emirati soldiers. Many of the Colombian fighters deserted, refusing to be substitute canon fodder. 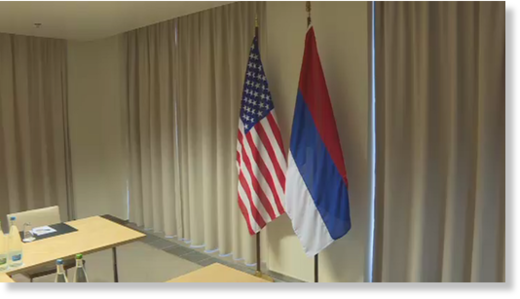 The US State Department just seems to lack attentiveness when it comes to minor details in US-Russian relations: the Russian flag was hung upside down in the conference room in Zurich ahead of a meeting between the top Russian and US diplomats. 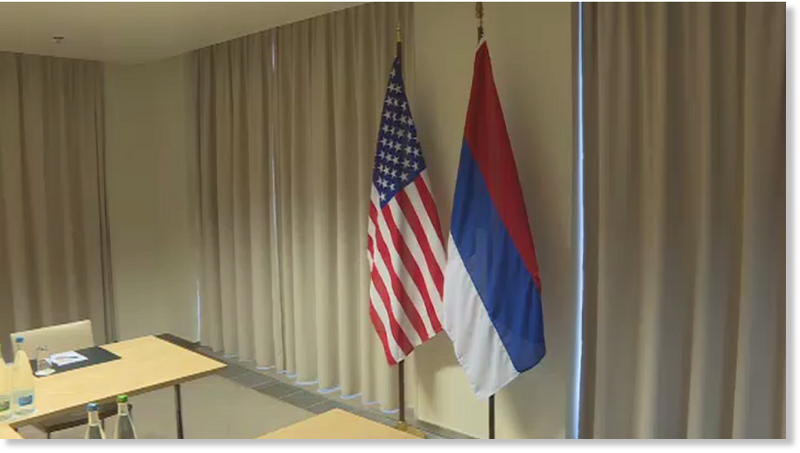 Ahead of the key negotiations between Russian Foreign Minister Sergey Lavrov and US Secretary of State John Kerry on the fate of Syria, the situation in the Middle East and the ongoing conflict in Ukraine, US State Department officials were left red-faced when a cameraman pointed out the fact that the Russian flag in the conference room was hanging upside down. As Deputy Assistant Secretary of State for Public Affairs Glen Johnson led journalists to the appropriate rooms before the diplomatic teams arrived, a cameraman alerted the US State Department official to the obvious mistake. “Hey Glen, the Russian flag is upside down so the colors [are] in the wrong direction,” the cameraman said. “I’m not bullsh**ting you,” the cameraman confirmed. “So the white should be on top?,” Glen Johnson double-checked, just in time to save face ahead of the diplomatic round. The flag of Russia is a tricolor flag consisting of three equal horizontal fields: white on the top, blue in the middle and red on the bottom. Back in 2009 the sharp-sighted cameraman was unfortunately not around to correct a previous high-profile diplomatic mistake by the US State Department team, then led by the former secretary of state, Hilary Clinton. A symbolic gift to Lavrov at the time, which was supposed to symbolize a thaw in US-Russian relations, turned out to be a total embarrassment for the entire US State Department staff. The American side had mistakenly attached the word “peregruzka”on a gift (a ‘reset’ button symbolizing a resetting of relations). However, the Russian translation for the word “reset” was incorrect and Lavrov could not resist a lighthearted remark about the oversight. “You’ve got it wrong,” Lavrov commented with a smile, explaining that the big red button actually read “overload” (the correct choice of word should have been ‘perezagruzka’). But the Russian minister nevertheless thanked Clinton for the warm intentions. Thanks to the sharp-eyed cameraman, a similar embarrassment was avoided this time in Zurich. Comment: The Dunning-Kruger effect strikes again! US officials are showing to be less knowledgeable about the world than the average cameraman. That should make Americans concerned about the state of their government. Edited and slightly abridged by Lasha Darkmoon, with minor additions not found in the original text. The practice of manipulating and controlling public opinion with distorted media messages has become so common that there is a whole industry formed around this. The entire role of this brainwashing industry is to figure out how to spin information to journalists, similar to the lobbying of government. It is never really clear just how much truth the journalists receive because the news industry has become complacent. The messages that it presents are shaped by corporate powers who often spend millions on advertising. Six conglomerates, which run this advertising, own 90% of the media: General Electric (GE), News-Corp, Disney, Viacom, Time Warner, and CBS. Yet, these corporations function under many different brands, such as Fox, ABC, CNN, Comcast, Wall Street Journal, etc, giving people the perception of choice. With alternative media on the rise, the propaganda machine continues to expand. Below is a video of Sharyl Attkisson, investigative reporter with CBS, during which she explains how “astroturf,” or fake grassroots movements, are used to spin information not only to influence journalists but to sway public opinion. — Creating of Wikipedia pages, monitored by corporations. — Creating a social media presence, including Facebook and Twitter accounts, run by paid professionals. — Secretly funding non-profit organizations to create third-party support and web presence. — Search engine optimizing web pages such as blogs and third-party sites that support a specific agenda. — Financing industry research that is deceitfully presented as independent opinion. — Funding experts working on unrelated projects, while in reality creating paid consultants. These methods are used to give people the impression that there is widespread support for an agenda, when, in reality, no such agenda exists. Astroturf tactics are also used to discredit or criticize those who disagree with certain agendas, using stereotypical names such as “conspiracy theorist” or “quack” to make people turn away from the truth and accept lies instead. LD: Don’t miss this 10-minute video. It exposes the hidden techniques of the Mind Manipulators to suppress the truth and create an entirely fictional reality whose ultimate aim can only be described as diabolical: to poison the wells of existence and enslave mankind, bringing us all under the dominion of the Architects of Evil. Nazi Forces Demolish Number of Civilian Facilities in Hebron. – 5 Palestinian civilians were killed in the West Bank and Gaza Strip. – A Palestinian civilian was killed and his brother was wounded in a deliberate run-over attack by settlers in the West Bank. – 23 Palestinian civilians, including 7 children and a female journalist, were wounded in the West Bank and Gaza Strip. ·Nazi forces continued to open fire at border areas along the Gaza Strip border area and a Palestinian civilian was wounded in the east of al-Shuja’iya neighbourhood. ·Nazi forces conducted 127 incursions into Palestinian communities in the West Bank and 3 limited ones in the southern Gaza Strip. – 77 Palestinian civilians, including 4 children, were arrested. – 6 of them were arrested in occupied Jerusalem. – 2 fishermen were arrested and their fishing boat was confiscated. – Nazi forces demolished a house in Beit Hanina and obliged a civilian to demolish a livestock barrack on his own. – Nazi Jewish Settlers wrote racist slogans on the walls of a church. ·Illegal Nazi Jewish Settlement activities continued in the West Bank. – 7 houses and 9 livestock and poultry barracks were demolished, and 47 fruitful trees were cut off. – 4 Palestinian civilians were arrested at military checkpoints. – An elderly woman from the Gaza Strip was detained and prevented from praying in al-Aqsa Mosque. Nazi violations of international law and international humanitarian law in the oPt continued during the reporting period (14 – 20 January 2016). Nazi forces have continued to commit crimes, inflicting civilian casualties. They have also continued to use excessive force against Palestinian civilians participating in peaceful protests in the West Bank and Gaza Strip, the majority of whom were youngsters. Occupied East Jerusalem witnessed similar attacks. During the reporting period, Nazi forces killed five Palestinian civilians in the West Bank and Gaza Strip; three of them were in the West Bank and the two others were in the Gaza Strip. Moreover, a Palestinian civilian was killed and his little brother was wounded in a deliberate run-over attack by a settler. Nazi forces also wounded 24 Palestinian civilians, including seven children and a female journalist. 11 of them, including three children, were in the Gaza Strip and the reminaing others were in the West Bank. Concerning the nature of injuries, 11 civilians were hit with live bullets and their shrapnel, 11 others were hit with rubber-coated metal bullets and two were hit with tear gas canisters. In the West Bank, Nazi forces killed three Palestinian civilians and wounded 13 others, including four children and a female journalist. Midlands in addition to more cuts in Hartlepool and at its Welsh sites. the town of Motherwell had been popularly nicknamed Steelopolis. the EU and imperialism generally) as friends. in this country, but throughout the world. It uses rational choice theory and Weber’s theory of instrumental rationality to examine the actions of key players from both the Yanukovich government, specifically various police and security forces, and opposition, especially of the extreme right and oligarchic elements, during the massacre. The paper analyzes a large amount of material available from different sources: about 1500 videos and recordings from the internet and television in different countries (about 150 gigabytes), newsletters and social media messages from a hundred journalists covering the massacre of Kiev, about 5000 photos, and nearly 30 gigabytes of radio interceptions of snipers and commanders of the Alfa unit of the Security Service of Ukraine and Ministry troops of the Interior and finally records of the massacre trial. This study is also based on field research on the massacre site, witness’ reports from both camps, the commanders of the special units, the statements made by current and former government officials, approximate estimates of ballistic trajectories , bullets and weapons used and the types of injuries on both sides. This study establishes a specific timetable for the various events of the massacre, the shooters locations and the precise timing and location of the death of nearly 50 protesters. This university investigation concluded that the massacre was a false flag operation, which was rationally planned and executed with the aim to overthrow the government and seize power. 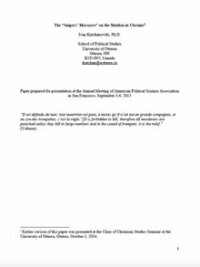 Ivan Katchanovski teaches at the School of Political Studies at the University of Ottawa. He has been a visiting scholar at the Davis Center for Russian and Eurasian Studies at Harvard University, visiting Assistant Professor in the Department of Political Science at the State University of New York at Potsdam, postdoctoral fellow at the Political Science Department at the University of Toronto and Kluge Postdoctoral Fellow at the Kluge Center at the Library of Congress.